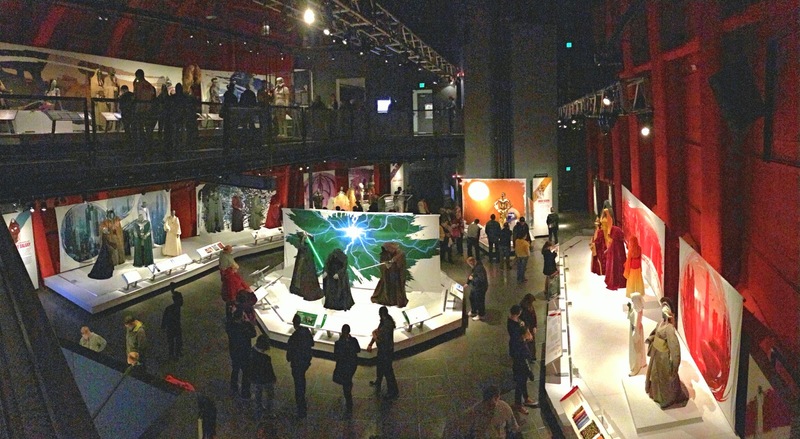 Rebel, Jedi, Princess, Queen: Star Wars and the Power of Costume is a new traveling costume exhibit that currently resides at the Seattle EMP Museum in Washington. It features 60 handmade costume from the Star Wars saga, all the way from Episode I to Episode VI. My friend Michael Bert recently had the opportunity to see this exhibit in person. Enjoy this exclusive interview with him about his experience seeing all of these original costumes. All of the photos in this article are courtesy of Michael. Michael Bert's interest with Star Wars started in 1977 after viewing A New Hope. He became a super fan after countless viewings of The Empire Strikes Back during the summer of 1980. That movie cemented Michael's interest in everything Star Wars for the last three and a half decades. Most recently, Michael became a member of Vader's 501st Legion as an Imperial Royal Guard. He currently troops with the Midwest Garrison and resides in the northern suburbs of Chicago. Q: First of all Michael, what encouraged you to check out this new costume exhibit in Seattle? A: A few months ago, I read an article about a new Star Wars costume exhibit that was premiering in Seattle on January 31, 2015. I also saw Anthony Daniels on The Comlink website covering the premiere. It looked amazing. I was hooked. The exhibit was scheduled for a 9-month run in Seattle before moving on to 12 other cities. Seattle was the first city, but no other cities were announced at this time. I didn't want to risk missing this exhibit, so I planned a weekend trip to Seattle. I have the original trilogy costume book that was released in October 2014. I found the pictures and significance of each costume fascinating. I read that there was a lot of information at the exhibit on what inspired the designs of the costumes, the trials and tribulations of getting them made, and the actors comments on wearing and working in the costumes. Give me a bunch of behind the scenes information, and I'm there. I also like to participate in trivia contests. I thought this exhibit would yield interesting facts that I could use to win future trivia contests. Besides, Seattle is also the home of Boeing Field and I could incorporate the Boeing tour during the weekend. Q: When you first saw the exhibit, what was your reaction? A: Excitement! After entering the doors to the exhibit, there is a large staircase brightly lit with cold white light. 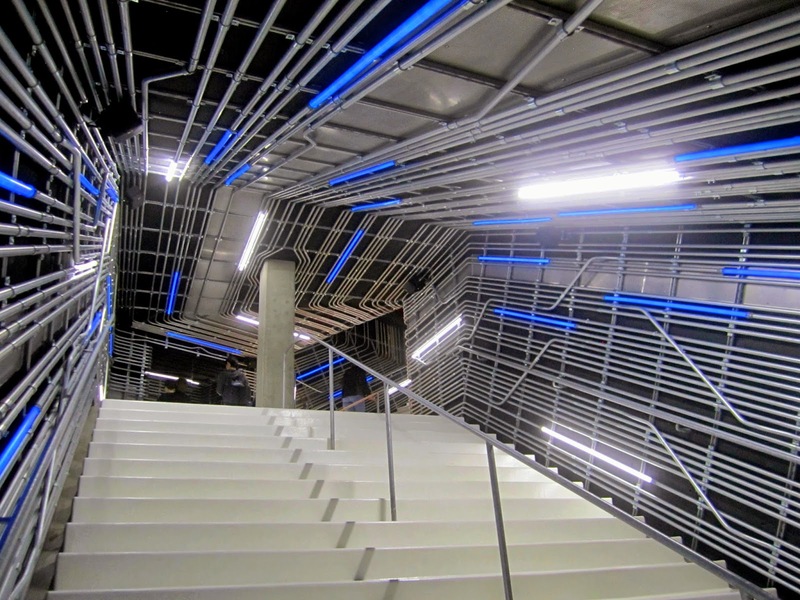 The walls had a series of parallel metal tubes lining the wall and blue and white L.E.D. tubular lights were mixed in. It gave you a sense of being inside a space ship or even in the cold hallways of Echo Base on Hoth. Finally, I was in The Empire Strikes Back. You got the sense you were headed for something special, something totally different. After ascending the stairs, a prototype Yoda was waiting for you and directing you to the main floor of the exhibit. This perfectly set the tone for what was ahead. I spent at least 20 minutes on the stairs, taking it all in, trying to stay focused, and enjoying similar reactions from other guests as they entered the exhibit. Once I was on the main floor, I didn't know where or what to look at first. I noticed a second floor that allowed a birds eye view of the main floor. I quickly made my way to the second level for an overview and decide where to start. Over the next 5 hours, I was able to see the entire exhibit. I started with an early admission time, which meant less people in the exhibit. It didn't get crowded until mid-afternoon when I was done or revisiting certain costumes. All the costumes had detailed information on their significance and place in the movies. Sometimes there were touchscreen devices that allowed you to view a clip from the movie where the costume is seen. Other times, there were digital voice recordings of the actor or designer giving insight on what it was like to wear or design the costume. I appreciated the historical and cultural aspects that influenced the designs from different world wars to ancient Chinese, Japanese, and African society. Swatches of material from different dresses or robes were there to touch. This gave you a real sense of the fabric's weight and texture. 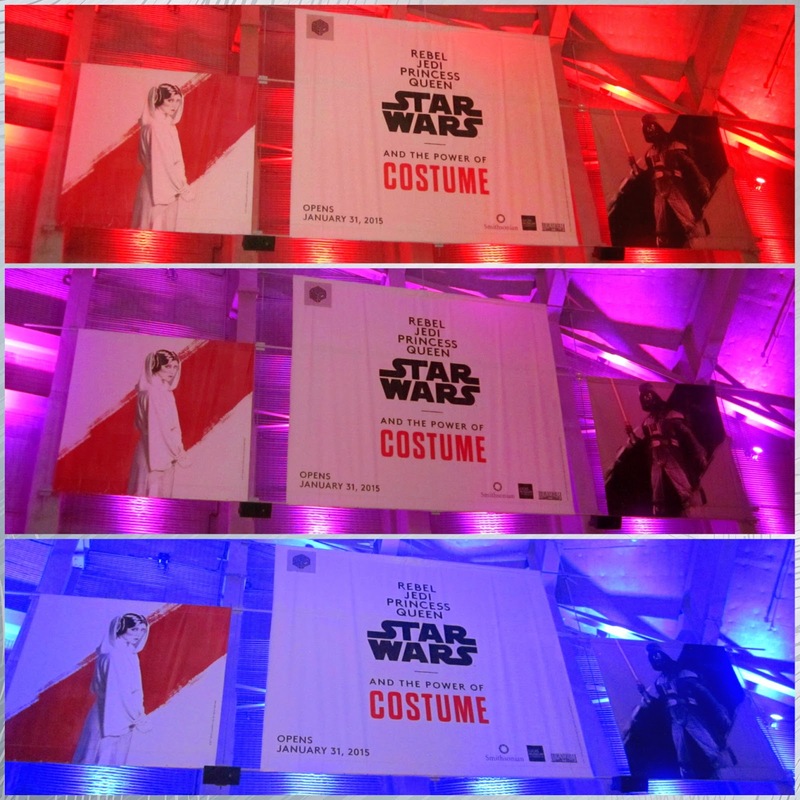 The exhibit did a great job of comparing and contrasting the costumes from the original trilogy to the prequels. A continuous Star Wars music soundtrack played in the background, adding to the excitement. Q: Were there any costumes in particular that you were really interested to see in person? 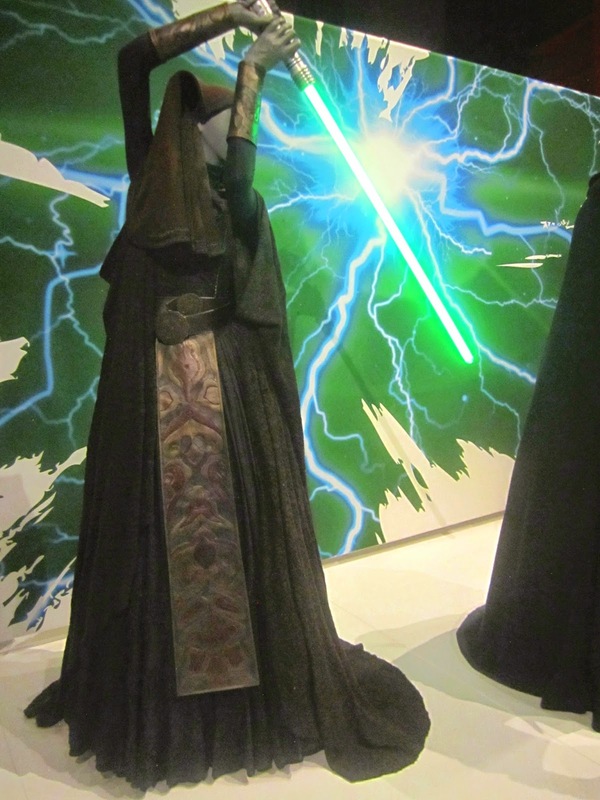 A: Since I dress as a red Imperial Royal Guard from Revenge of the Sith, I really wanted to see one in this exhibit. Unfortunately, it was not part of the exhibit. I did get to see a Blue Guard from Episode I. It was very impressive. Second, I wanted to see anything Leia. 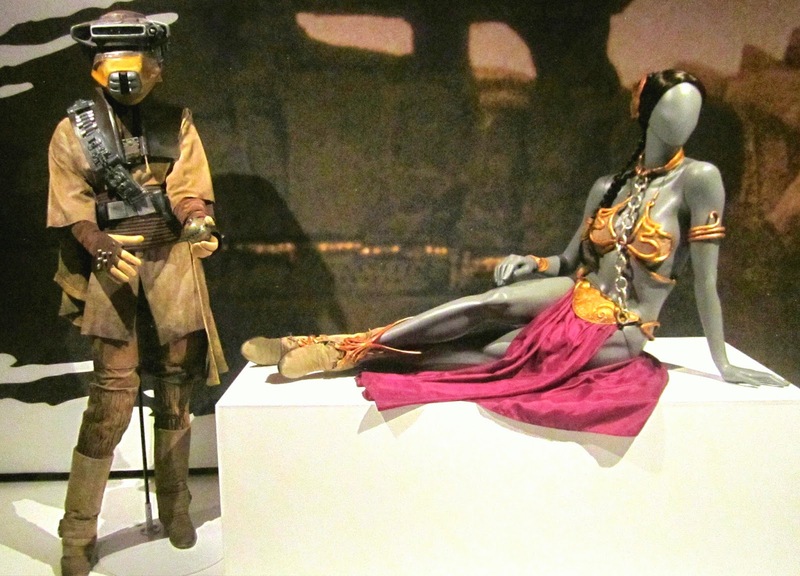 Luckily, Leia 's Slave Bikini was on display, as well as a colorful quote from Carrie Fisher, depicting what it was like to wear that costume. Other notable costumes were Padme's wedding dress, her all-white Geonosis arena costume, her Lake Retreat Dining Gown, Lake Retreat Arrival Gown, and Picnic Dress. Basically, it was Padme, Padme, Padme! Even Carrie Fisher was quoted to say that Leia had only one white dress, sorry, two dresses. In comparison, Padme had a dress or outfit to suit every occasion. In all three prequels, she wore 37 different costumes. This was intentional to set apart the original series vs. the prequels. Q: Can you tell us about some of the funny stories that you learned at the exhibit concerning certain costumes? A: I have a few favorites. I had two laugh out loud moments. First, with the Lake Retreat Arrival Gown Padme wore in Episode II. 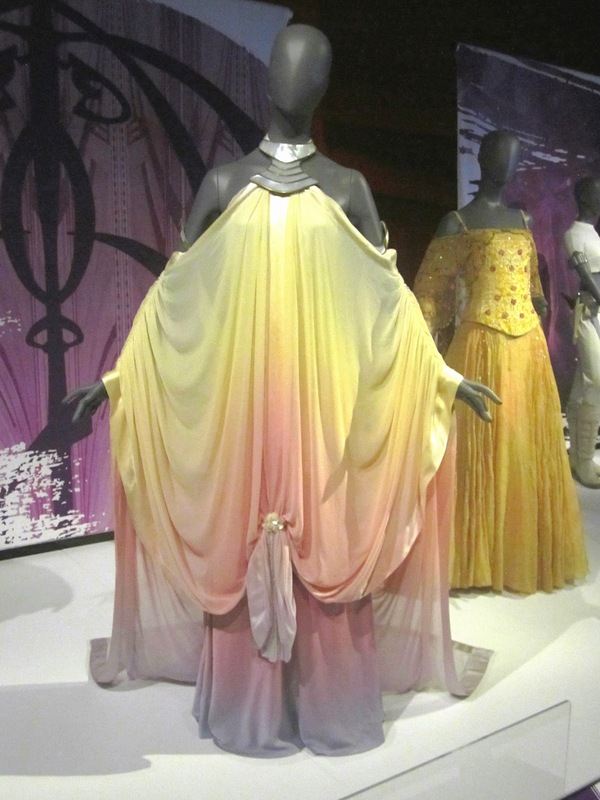 The scene was full of romance where Padme and Anakin first kiss.This silk chiffon and silk satin dress, held at the neck and arms by abalone shell, was a design that "looked as if it would fall off in one sneezed." Can you imagine if that actually happened? 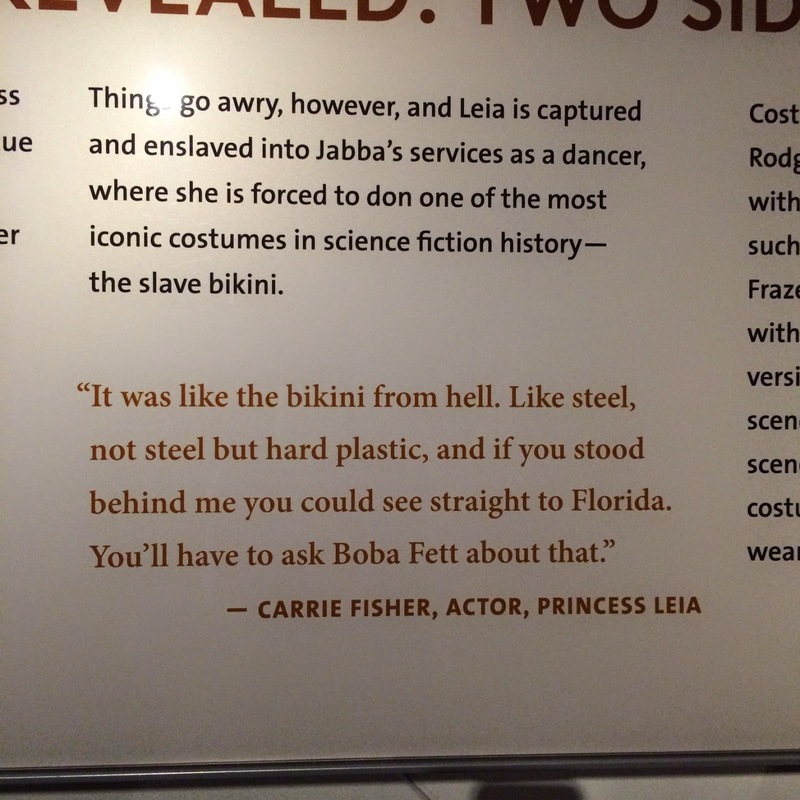 My second moment was with Carrie Fishers' quote on wearing the Slave Bikini. She felt it was the bikini from hell. Anyone standing behind her while wearing the costume could see straight to Florida. Interestingly, there were two bikinis. One made of rubber for action scenes, and one of steel for poses. 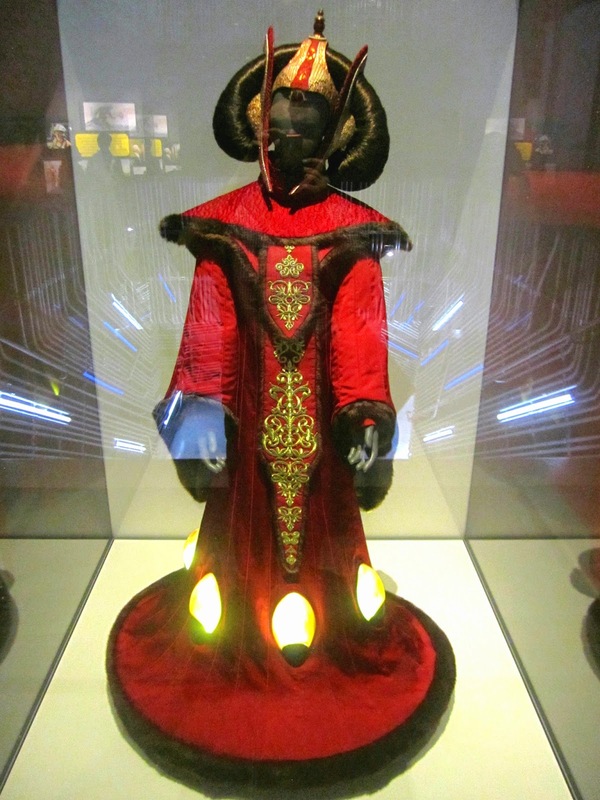 Some other surprising tidbits included the Throne Room Gown from Episode I. The lights at the base of this dress had to be powered by a car battery that was hidden between the actor's leg. The wedding dress from Episode II was an all-nighter. The pearls were a last minute decision and designer, Trisha Biggar, pearled them herself. During a wet scene, a Jedi's vintage wool cloak had to be replaced after each take since the fabric would shrink and shorten. Other Jedi robes, like that of Luminara, had details that represented her home planet. Even George Lucas was involved with the design of the Lake Retreat Dining Gown with Feathered Cape. Natalie Portman revealed that George himself designed this dress for her and that the corset was so tight, she could barely breathe. Q: How did you like seeing the costumes without being covered with glass? A: This was very satisfying on many levels. It didn't create a barrier between you and the costume. While you couldn't get close enough to touch (without and alarm going off, trust me), you could feel a part of the action or a part of the exhibit. The exhibit was much more personal for that very reason. You were engrossed in the exhibit. For costumers, it allowed an ability to get close enough to take detailed photographs to duplicate the costume. I saw many people doing this, as did I. The entire exhibit had an open, inclusive, welcoming spirit. The decision to not have everything covered in glass really enhanced the experience. Q: After going through the entire exhibit, what was your opinion of the exhibit layout and the costumes that they had on display? A: The exhibit had 60 original costumes on mannequins. The space was very large and allowed for many people to be in an area without feeling crowded or rushed. It was on two levels, with the second level being a little smaller than the main floor. I was really impressed with the exhibit and the amount of information and background stories it provided. It was really well done and organized. Original concept artworks by Ralph McQuarrie were on display next to the final products. Additionally, historical photographs that provided the inspiration for many of the costumes were detailed and documented in this exhibit. Really, this exhibit has something for everyone. Did I mention, Star Wars music is constantly playing in the background. What's not to love? Q: Would you recommend Star Wars fans to check out this exhibit? A: Absolutely! Hopefully it will come to a major U.S. city in your area. I couldn't wait or chance it. Keep checking the website to see if other cities are listed. I would definitely see it again if it comes to Chicago or if I happen to be in a city that it is also in. The exhibit offers great background to the significance of each costume. It compares and contrasts the costumes of the original trilogy versus the prequels. Even if that doesn't matter to you, the mannequins are displayed in action poses with light sabers that light up and force lightning that electrifies you. Besides, it's Star Wars! Q: Is there anything else you would like to share about your experience at "Rebel, Jedi, Princess, Queen: Star Wars and the Power of Costume"? A: I definitely recommend buying an entrance ticket as soon as the museum opens. Doing the online order really allowed you to walk right in. Also, the space is not crowded and you will have time to take photographs and go at a snails pace without other patrons glaring at you. The exhibit had a long wait in the afternoon, even in off-season. Don't expect any guides or merchandise exclusive to the exhibit, there wasn't any. A lot of Star Wars merchandise is for sale, but it can be purchased anywhere, cheaper. A majority of the costumes relate to Episodes I and II. Like I said, Padme, Padme, Padme. If you have time, the rest of the museum is certainly worth a browse. There is a Nirvana exhibit as well as an incredible guitar exhibit. I really enjoyed that as I used to play the guitar. Mostly folk. Yeah I know, I'm old. There are even sound rooms for personal jam sessions with a full band. I killed it. The museum has a pop culture atmosphere and it will not disappoint. There is even a room with an IMAX size screen playing current and vintage music videos. If that's not enough, the grilled cheese and chips in the cafe was worth it as well. No wait at the bar. Pop-up videos (circa 1996) was playing while I ate. All in all, a great time. Definitely worth the trip. Awesome interview! I'd love to go see this exhibit in person. Sadly, it's on the other side of the country. One day maybe! Keep up the great work!